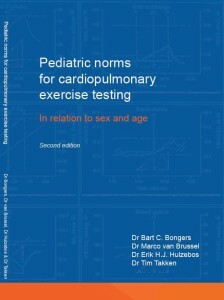 The current book provides the latest pediatric norm values for cardiopulmonary exercise testing using a cycle ergometer. It describes how to assess the quality of the delivered effort and provides pediatric norm values for aerobic capacity, ventilatory threshold, and several cardiac, Pulmonary, and peripheral variables at peak exercise. The normative data in the current book includes both absolute and relative values, depicted in simple, operational graphs for boys and girls separately, which can be consulted for a quick as well as an extensive interpretation of the cardiopulmonary exercise test. Next to providing the reader with norm values for children ranging from 8 to 18 years of age, this book gives background information for each exercise variable, which makes it an excellent reference for those involved in cardiopulmonary exercise testing, including (clinical) exercise physiologists, (pediatric) cardiologists and pulmonologists, pediatricians, sport physicians, and physical therapists. Order: Use the Book order form. Alternatively sent email with name, delivery and invoice adress, paymet option, and number of copies to: Tim Takken.